The PSU-93 and FPW-15 are power supplies which can provide power for signal conditioners, temperature and pressure transmitters and other electronic equipment. 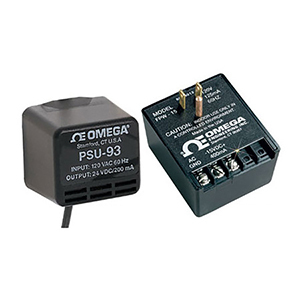 The PSU-93 is an unregulated power supply providing 16 to 23 vdc with a maximum output of 300mA. The FPW-15 is a regulated power supply delivering 15vdc at 400mA. These power supplies provide a low-cost solution to excitation problems. The compact design allows for plug in operation eliminating the need for hard wiring.